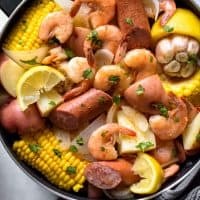 If you're looking for an easy meal to feed a crowd with, a low-country Shrimp Boil is it! Complete with shrimp, sausage, potatoes, and corn, it's a hearty one-pot feast that's ready in no time at all! Add water, beer, shrimp boil seasoning and salt to a large Dutch oven (8-12qt) or boiling pot set over high heat. Slices the tops off of each head of garlic and add them to the pot. Cut each lemon in half and squeeze in the juice, then add the halves to the pot. Bring everything to a boil. When boiling, add the potatoes and onions to the pot, cover, and cook 8-10 minutes, until they just begin to feel tender. Add the sausage to the pot, cover, and cook 5 minutes. Add the corn halves to the pot, cover, and cook 6-7 minutes. Lower the heat to medium-low and add the shrimp. Cover and cook 2 minutes, then turn off the heat. Let sit for 10 minutes as the heat comes down, allowing the contents to absorb the flavors. Remove 1 cup of the broth from the pot, then drain the rest of the liquid out. Remove the garlic bulbs and place each one in two small bowls. Use a fork to smash the garlic, then add 1/2 cup of broth and half of the melted butter to each bowl. Stir well. Transfer the contents of the pot to a large serving platter, or spread it out on a newspaper-lined table. Serve with the garlic butter and additional lemon wedges.